In late February 1939, roughly 22,000 people gathered at New York City’s Madison Square Garden for a rally, which included a 50-member drum and bugle corps and a color guard of more than 60 flags. The 1930s were a boon period for American supporters of Adolf Hitler’s Third Reich. A depressed work force coupled with little chance of upward mobility and an economy not yet on the rebound led to a majority that was fearful of their place in the world, and Hitler’s rhetoric added fuel to an already lit population. In 1933, deputy fuhrer Rudolf Hess ordered Heinz Spanknobel, a German immigrant, to form Friends of New Germany, a group based in NYC, with the goal of spreading National Socialism throughout the United States. Though Spanknobel was eventually forced to leave the country—he had failed to register as a foreign agent—and his organization collapsed, the German American Bund, or Amerika-Deutscher Volksbund, emerged in the vacuum and coalesced FONG and the other American-based groups that supported the Reich. According to historian Warren Grover, the German American Bund was “the largest and best-financed Nazi group operating in America,” financing youth summer camps and family retreats in states like New Jersey, Wisconsin, and California (among others) and espousing concepts of pan-Germanism and a worldwide Jewish conspiracy. Our government provides for free speech, and in this city that right will be respected. It would be a strange kind of free speech that permits free speech for those we agree with. 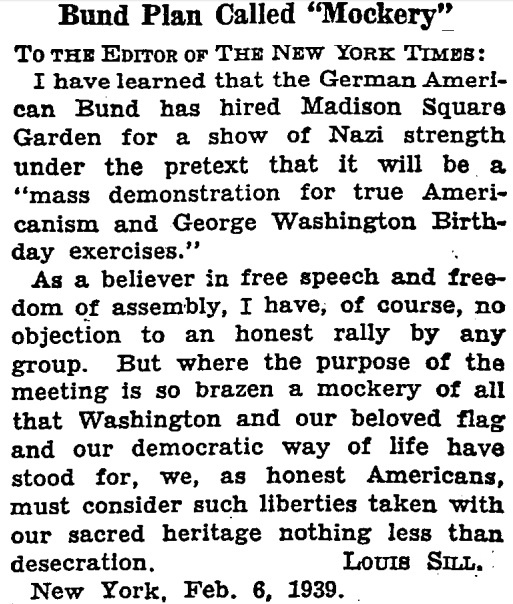 From 2/6/1939 New York Times. Among those who pressed against the horses, fighting for every inch of ground, were Spanish and Latin American workers, aching to strike the blow at fascism which had failed to strike down Franco; Negroes standing up against the racial myths of the Nazis and their 100% American allies; German American workers seeking to avenge their brothers under the heel of Hitler; Italian anti-fascists singing “Bandera Rossa;” groups of Jewish boys and men, coming together from their neighborhoods, to strike a blow against pogroms everywhere; Irish Republicans conscious of the struggle for the freedom of all peoples if Ireland is to be free; veterans of the World War; office workers, girls and boys, joining the roughly-clad workers in shouting and fighting; workers of every trade and neighborhood of the city. The Pro-American Rally was the Bund’s final hurrah; its leader was convicted for tax evasion and embezzlement and the group dissolved after the United States entered World War II, but it never really disappeared. The recent violence in Charlottesville is a reminder that hate and fear don’t need many openings to cross from the shadows and into the mainstream. Once there, it is difficult to unroot.